3rd EUMLS Conference "Mathematics for Life Sciences" will take place in Rivne (Ukraine) at Rivne State Humanitarian University, Rivne, str. Ostafova, 31. Provides training in higher education with humanitarian, cultural, scientific, economic and other areas. It is a leading scientific center; promotes scientific knowledge; conducting cultural and educational activities among the population. The structure of the University consists of Institute of Arts and the Institute of Psychology and Education, 11 faculties, 50 departments. 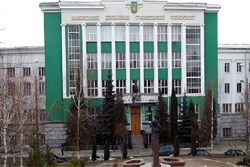 Currently studying at the university carried out in 11 departments: Ukrainian and Foreign Languages, pedagogical, psychological, natural, historical, sociological, mathematics and computer science, physics and technology, music and teaching, communication and management of documentary, artistic and pedagogical faculty of musical creativity.